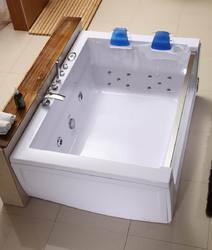 Enriched with years of experience in the industry, we are engaged in offering Jacuzzi Massage Bath Tub. 2. Jets: two types of materials--plastic or stainless steel. 3. Color: according to the requirements of customers . 1. 1.0HP specific water pump system is strong water power, at 165 litters/m peak the discharge of water, ultimate total headed 15 meters, more comfortable massage and lower noise. 2. Safety and durable are worthy of implicit belief.Protection switch, air-switch, much more safety, UL quality certification. 3. Humanization massage pillow make you for nicety and ease. 4. Waterfall input system is saver of time trait. 5. Three functions adjustable shower is your personal choice. 6. Standard temperature setting faucet is luxury, safety, comfortable and thermostatic(controllable 38 centigrade). 7. 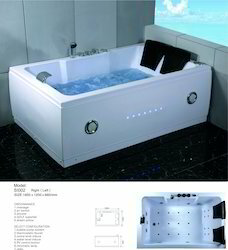 Bottom pool light controlled by digital panel and stereo radio can ease pressure and regulate emotions. 8. Towel bar and luxury commodity shelf are more convenient and practicable. 9. Air switch avoids dangerous of electricity so as to be high safety performance. 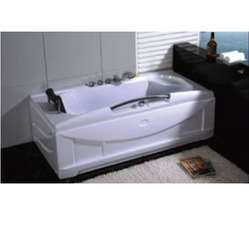 We offer high quality of message bath tub and acrylic tub with 1HP pump, massage jets, mixers and control panel, tub fillers, hand shower etc. 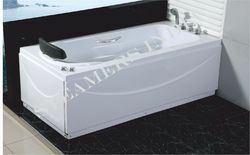 Enriched with years of experience in the industry, we are engaged in offering Jacuzzi Massage Tub Single Seater. Located along the back edge of the whirlpool bath this control panel allows you turn the air massage jets on/off and turn the water pump on/off. 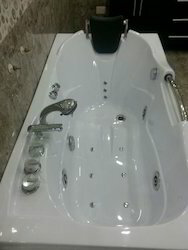 The pressure of the water jets can be controlled using a dial on the side of the bath. 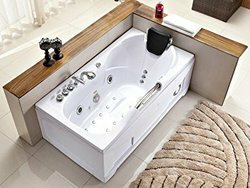 To compliment the water massage jets this dual action massage system also provides an air pump and 10 air jets that line the base of the whirlpool bathtub to provide a complete body massage. financial investment that requires precise planning and commitment. failure that could lead to unit break-downs. quality control team before they are packaged and sent out. spare parts. Your statutory rights are not affected. Hydrotherapy has been shown to reduce aches and pains with a combination of powerful massage therapy and heat. Loaded with Six heavy high-volume, sophisticated massage jets and four full-therapy Spnials Jets, the Models SI018 certainly offers the ultimate spa experience. With different Relaxing Experience, everyone can Enjoyed it, just the right amount of pressure. 1. 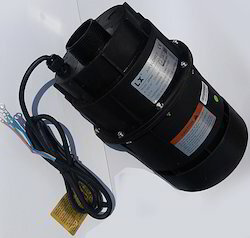 1.2HP specific water pump system is strong water power, at 355 litters/m peak the discharge of water, ultimate total headed 15 meters, more comfortable massage and lower noise. 2. Safety and durableare worthy of implicit belief.Protection switch, air-switch, much more safety, UL quality certification. 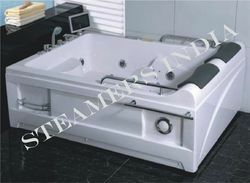 We offer the wide range of Jacuzzi Air Blower to our clients as per their requirement.